After two disappointing home losses, the Vancouver Canucks might welcome a trip to Chicago. The Canucks look to get back on track while trying to continue their recent success over the Blackhawks on Sunday afternoon. Vancouver (32-22-10) opens a brief two-game trip after falling 3-2 in overtime to Columbus on Friday. The Canucks blew a 2-0 third-period lead, two nights after giving away a late 2-1 advantage in a 3-2 shootout loss to Northwest Division rival Colorado. Though Vancouver is 5-0-3 since losing 6-2 to the Avalanche on Feb. 9, the Canucks can't afford to be giving away points as they try to improve their position in the crowded Western Conference playoff race. "It's frustrating," recently acquired forward Matt Pettinger said. "We got to have those games, especially at this time of year, we got to learn from it, move on and make sure it doesn't happen again." Vancouver has a good chance to rebound Sunday as it tries for a fifth straight victory over the Blackhawks (30-28-6) and sixth in a row in Chicago. The Canucks, who won 3-2 in a shootout at home over the Blackhawks on Feb. 10, are 7-0-1 at the United Center since a 3-2 loss on Dec. 17, 2002. "We are all going to learn from (Friday), we have no choice, we are in a playoff race and we have to win the next game," said Vancouver coach Alain Vigneault, whose team looks to sweep the series from Chicago for the second time in three seasons. "We're going to step on the ice on Sunday afternoon in Chicago and we're going to play hard." On Friday, Sami Salo and Ryan Shannon each had goals, while Taylor Pyatt added an assist in his second straight game for the Canucks, who have had six of their last eight contests decided by one goal. Salo, who's scored four of his five goals in the last nine contests, has two assists in three games versus Chicago this season. Roberto Luongo made 30 saves, but suffered his second straight loss Friday. Luongo, though, is 4-0-0 with a 1.20 goals-against average in his last four starts versus the Blackhawks, including a 2-0 win on Nov. 25 for his second career shutout against them. The Blackhawks are looking for their first winning season since 2001-02, and are also trying to work their way into playoff position. Though Chicago lost 7-4 at Dallas on Thursday, it has won three in row at home, recording shutouts in its last two. The Blackhawks finished 7-4-2 in February. The Blackhawks, who haven't recorded three straight shutouts at home since Jan. 19-27, 1972, look to bounce back after allowing four more goals Thursday than they have in their last five home games combined. Patrick Lalime, who made 32 saves in a 1-0 win over Phoenix on Wednesday, could be back in goal despite allowing five goals on 13 shots before being pulled against Dallas. "That's what happens when you make mistakes against a team like that," said Lalime, who is 12-10-1 with a 2.78 GAA and seeing more time with Nikolai Khabibulin day-to-day with back spasms. 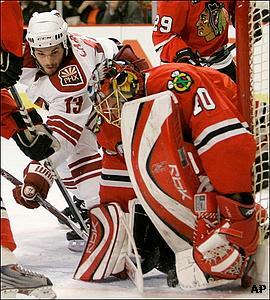 Lalime is 5-3-1 with a 1.78 GAA against Vancouver, but has lost four of his last five starts versus the Canucks. Andrew Ladd scored his first goal with the Blackhawks Thursday after being acquired from Carolina on Tuesday.